Concentrated Blue Dye. Detects Leaks and helps indicate the drilling results. As low as $21.25/gallon. Call our Sales Team Today! 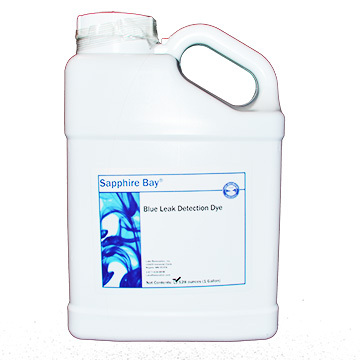 Use our Sapphire Bay® Blue Dye for a wide variety of oil field applications. Our customers in Louisiana, and in Western and South Texas, use our blue dye in oil well completion applications. Great dye for oil completion services and applications. Contact us today---Toll Free #1-877-428-8898! Gallon Packs are available. Get 144 Gallons for $3060.00. That is $21.25 each gallon. All dyes are food-grade, which means that they will pose no threat to wildlife or environment. Our highly concentrated dyes help you determine and distinguish ground materials, as well as help you determine results of drilling. Sapphire Bay dye has been used in oil fields across the country to help quickly and efficiently solve issues that arise while drilling, assuring quality and giving you peace of mind. Click here for more information about dyes.